Only three wins off third! Seriously though, where has it all gone wrong? Since our defeat of Sendai back in May, we've only picked up four points in 9 games and have fallen to 13th. I'll say from the outset that I wasn't able to watch the game yesterday. I was at hanabi (that's fireworks to you and me) and what happens when you get 100000 people together? No reception on my phone, so no chance of even keeping in touch via Twitter of the goings on in Yokohama. 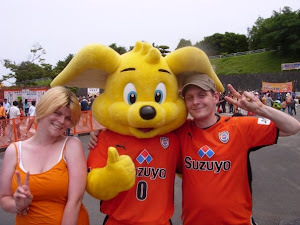 The word from one Marinos fan was that we were unlucky and they were mediocre. I reserve any comment because I simply can't speculate. What I will say is that in this difficult time we need to stick together, be professional and get through it. We didn't get to 2nd in the table by luck, and while we've faltered, we can turn it around. If I had to pick out the best performers so far this season I'd list, in no special order, Hayashi, Jong-a-Pin, Kawai, Brosque, Lee, Takagi, Muramatsu. What do most of those have in common? They're Ghotbi's boys. The team is being built, and it takes time. It was never going to be a one year job. OK, so Jymmy isn't really working out, but I can guarantee our manager isn't one to hesitate to fix a mistake. The legacy of Kenta's team still hangs heavy over the current set up. 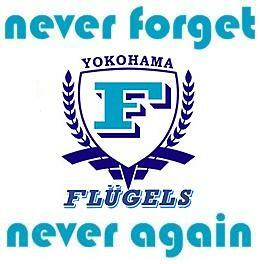 Let's not get nostalgic - Mr. Nice Guy Hasegawa was granted SIX YEARS and we didn't win anything. We threatened to challenge for the league three times before choking on each occasion, and we blew three finals (and three semi-finals). We displayed no lack of talent, but a consistent lack of ability (discipline? professionalism? focus?) to be anything other than nearly men. The reason Kenta announced his resignation with several months of the 2010 season remaining was down to the growing discontent at the same old story unfolding. That team had to be rebuilt from the ground up, and that was always going to be painful. The recent loaning of Edamura to see out his contract with Cerezo Osaka is a case in point. The affection I witnessed towards him was unlike anything I'm used to as a fan of English football. It was as if a family member had been sent away. He'd been given plenty of pitch time in 2011, but as far as Ghotbi was concerned it wasn't working out. We have a wealth of young talent in midfield and I'd rather see us focussing our future on those. That our best, hardest working and most professional players are the recent intake speaks volumes. Ota, who was only ever out for number one, was earning a vastly inflated wage, and took off at the first offer of even more. Is Iwashita even half the player he could be? Lack of focus? Certainly lack of discipline at times, and we all pay the price. The very fine margin of error in the J. League between championship winning teams and also rans is focus and professionalism. If we have players not 100% professional and focussed on their job - which is being top athletes, and working hard to be the very best footballers they can - then we're never going to win anything. Anything. Just like the previous ten years before Ghotbi's revolution began. If we need to go through some tough times while we build a team made of those kind of players, then so be it. Three years is the minimum it takes for any manager to create a team of his own. We're only 18 months into Ghotbi's reign, and any rash actions would do more harm than good - by a mile. Unity. While we get things back on track. The Mosaic - Complete and Available Now! Hope you kept your ID number safe. I don't fancy your chances of finding yourself within the 20000+ others on the recently unveiled 20th Anniversary mosaic without it! The complete mosaic is available to view here. Just put in your ID number in the bottom right box and click the search button. If you sent in your picture and wish to purchase one you can do so here, via the official online shop. If you don't read Japanese or need it shipped beyond Japan, then we may have a problem. As far as I'm aware, there is neither English support or an overseas delivery option. I've already had a request from one contributor about getting one sent to North America. This is still in process, but I'll let you know if it's a success. 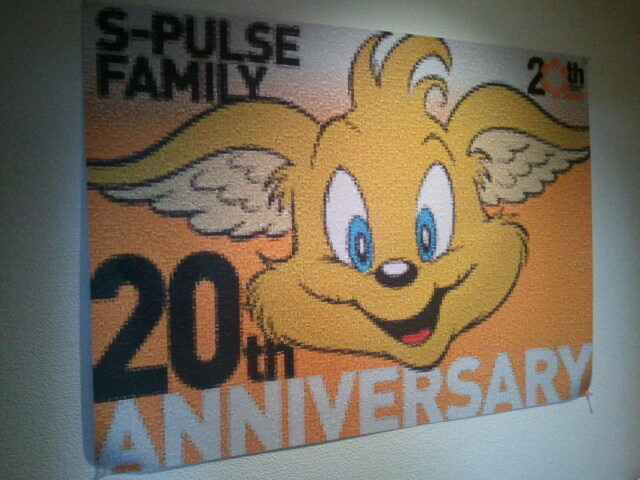 If so, it could pave the way for me to me help others hoping to buy S-Pulse goods. I already know of several people around the world hungry to display their allegiance to the Orange Machine. Anyway, for now, enjoy the mosaic! The reaction in the stands was actually pretty funny, with plenty of people (women) making disapproving noises at the news. I'm sure she'll be a hit with the kids, though, and a whole lot of merchandising can only be a good thing, money-wise. What's her name going to be? Who knows. I'm going to guess at Shimichan. Announced over the last couple of days was the news that Tsujio and Edamura have been loaned out to Hiroshima and Cerezo Osaka respectively. Tsujio's deal is until the end of January 2013, while Edamura will be at Cerezo until the end of January 2014. Well it's a funny old game. Yep, it really is. But then there comes a point where funny turns to comedy, then comedy turns to complete bloody farce. At the full time whistle, Nihondaira rang to the sound of warm applause. The massed ranks of supporters rose together as one and gave a heartfelt standing ovation to their team. A team which had just lost a goal lead in the last five minutes and then subsequently the game. Not one single boo. It was a surreally moving experience, but how to explain such a bizarre juxtapositioning? Yuichi Nishimura. The match started well but rapidly became a shambles; one bad enough to put people off the game. Why would you bother watching a sport when such mismanagement by the man in black sees to it that the game will only end in one outcome? Both teams were up for it, and a decent crowd was in attendance for what should have been a tightly fought, entertaining game. As it turned out, it was 11 v 11 v 1. Well, actually it was 10 v 11 v 1. No, sorry, beg your pardon, 10 v 10 v 1. Oh no, I stand corrected, 9 v 10 v 1. Straight out the traps, Nishimura, Referee of the Year 2009 and 2010 (seriously! ), was eager to show who was in charge. Three yellow card for the visitors in under 25 minutes was then balanced out somewhat by two yellows in ten minutes for Iwashita. The first one was a truly daft handball in the area and hard to argue with, but the second? It was a hard sliding challenge, the Kashiwa man made a huge meal of it (of course), and Iwashita needed a talking to to calm it down, lest he be taking an early bath. Referees are granted the luxury of using their common sense, after all. But, no. The robot in black waves another yellow card and we're down to ten men before half time. 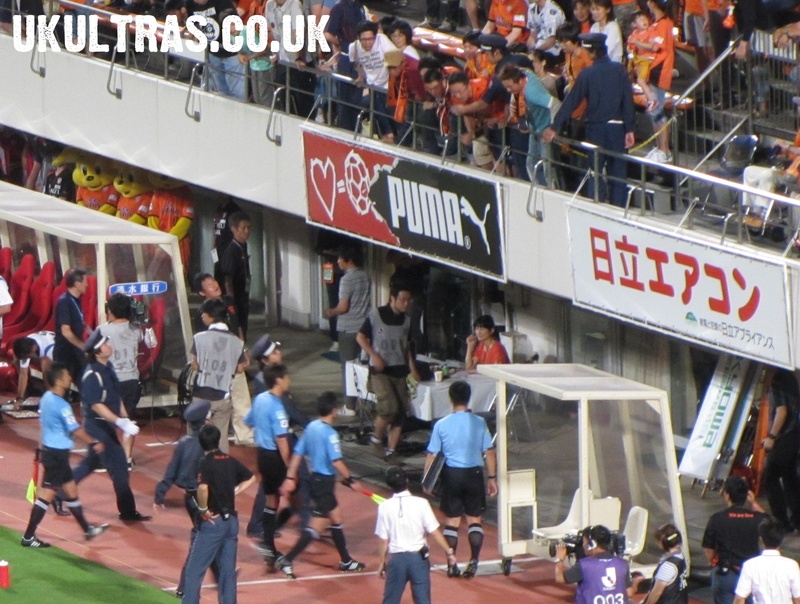 Cue some heroics from Shimizu and within 20 minutes of the restart we're two goals in front. Takahara got his first of the season (it's been coming), and Brosque capitalised on a schoolboy error from Kashiwa to make it three.With ten men we were the better team. Energy and positivity oozing out of every pore, an offence minded substitution in Takagi for Ono, and we were in the ascendancy. Kashiwa looked as much like defending champions as Consadole Sapporo (OK, maybe a little harsh, that), but even with a man advantage they laboured their way forward and looked unlikely to get back into the game. But then the 66th minute rolled around and all hell broke lose. With the ref's needlessly strict and confrontational performance, the day became a farce. It was a physical, but not a dirty, game and it was not worthy of all the cards. What is it they say? A good referee is a referee you don't notice? Fat chance. This game would have ended with 11 on each side had the man in black any decent man-management skills. And that is my problem with him. The mechanical, arm-to-pocket reaction he has when he sees a foul soon destroys any keenly contested game by removing players from the field, changing the game flow, and ultimately ending the game as a contest. Playing with nine men in overbearing humidity was never going to end any other way, and despite a brave effort, the result was decided there and then. You just can't cover a full sized pitch with so few players, and with ten men to our nine Kashiwa must have had 80% possession or more, basically enjoying shooting practice. Perhaps the craziest part is that at 3-4 we nearly equalised twice, with one shot stopped only by some true heroics by Sugeno. Reysol have about as much chance of defending their title this season as Sapporo of staying up, and last year's glory must feel a long way away barely getting a result in overwhelmingly advantageous circumstances. Another loss, seven games without a win, but three goals scored and we were united at the whistle. United in our collective frustration at the head official. For today was a situation first made difficult, then made impossible, and yet we didn't drop our heads and showed a whole lot of spirit. That's important and didn't go unnoticed or unrecognised. A roller coaster of a game, but for all the wrong reasons. I don't ever want watch another game with Nishimura in charge. Seriously. It's pointless. If every ref was like him, football as a spectator sport would break down and eventually cease to be. At least he hasn't been selected to referee at the Olympics or anything... Oh. We've had some wretched luck over the last few weeks, we're better than this and we know it. We drop to 12th which is no fun whatsoever, but only six points off an ACL spot. Optimist? Yep. ;) Away to Yokohama in a fortnight, but before that it's Nagoya in the league cup on Wednesday 25th. It's the first leg of the 1/4 final at Nihondaira, kick off 7pm. All the cards. Some of the early ones were valid, no question. It's the later ones where Nishimura needs to calm the hell down, use his damn common sense and stop waving them around so freely. If you have the time or the inclination, here's 25 minutes of extended highlights. Announced last Saturday at our 20th anniversary game was our all time best 11. Brought to you in English, probably for the first time anywhere, here it is. 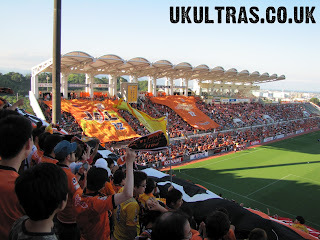 Personally, I only saw around half those players in action, only becoming a regular at Nihondaira in 2004. Can't really argue with the selection, although Ono is as good if not better than any player who has ever worn the orange shirt. He's only been here a short time though, so would be very hard pushed to edge out favourites (indeed S-Pulse legends) like Sawanobori and Teru. Okazaki has already been gone two years, but it feels like yesterday seeing him bang, or nod, them in week after week. Hope he comes back to us when he returns to Japan. To think, Freddie made our all time best foreign eleven making only 8 appearances, and only three of those were for the full 90 minutes! Guess many people were voting for the prestige factor rather than what he actually achieved in an orange shirt. Great to see current defenders Jong-a-Pin and Lee Ki-Je in there. No coincidence we have the joint best defence so far this season. Santos was a true S-Pulse hero in his day, and Jae-Jin's Jubilo destroying goals will live with me forever. Pretty good XI. It's amazing how much better things seem after a nice sit down and a cup of tea. The initial frustration of failing to find the net again shouldn't be dwelt on too strongly. One goal in six games has left us all at our wits' end, and the players too are clearly desperate to break the barren spell. It's a combination of that desperation and just plain bad luck that saw today draw another blank. At least three times we had chances that on another would have gone in. Nobody is to blame, as some of the football we played had us scything through the visitors, but I could understand the feelings of anti climax on our big 20th anniversary bash. What I thought was a bit ott was the group of around 20 fans booing the team bus as it left the stadium. 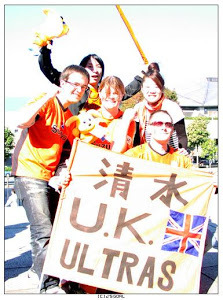 I was still hanging around an hour after the full time whistle waiting for a bus (the poor access, especially from Nihondaira after games must put off hundreds of casual punters) and was surprised to see a few people had waited just to boo their team. We're not playing badly, we're just not scoring goals. We're not conceding either especially and have the joint best defence in the country. A win next week (easier said than done I know - it's against the champions) would see us possibly as high as 4th. Well, for that handful of people booing the team bus, there are 15000+ who aren't, so don't let it get to you, lads. Right, more to come tomorrow. I'm off out for a beer or two. Even the Back Stand got in on the banner action! Skip along to 0:40 for a look at today's choreography. Top effort! 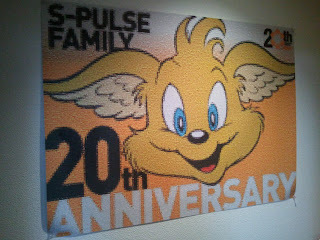 Born on the 4th of July - Shimizu S-Pulse! 20 years ago this very day, something special happened. 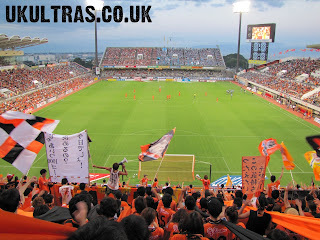 The very first game by Shimizu S-Pulse was played away to Gamba Osaka. 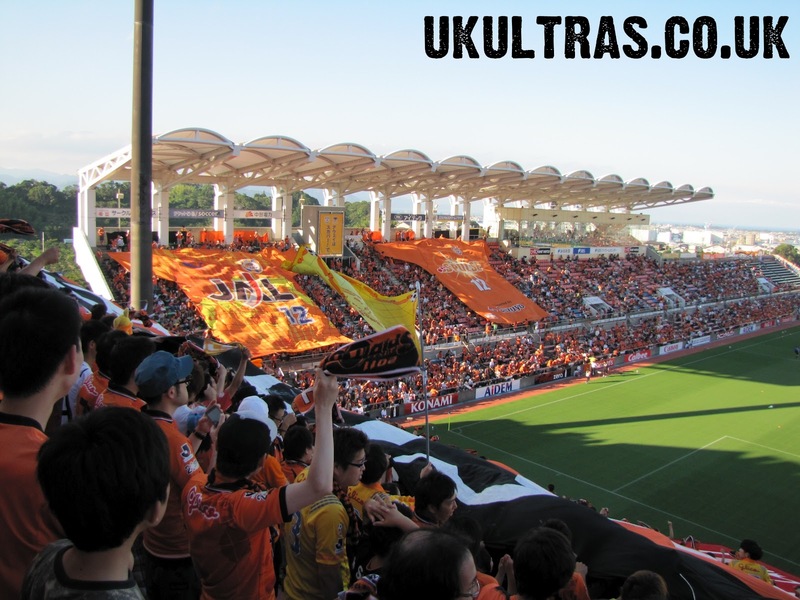 The J. league has come a long, long way in a short time. Teams have dominated then fallen, big guns have got relegated and faded to mere shadows of their former selves, and even one team was callously folded by it's owners. S-Pulse has trodden a long and eventful path of it's own, almost going to the wall at one stage, saved by the efforts and actions of the local residents. Two decades on from that first game we can proudly claim our status as one of the original ten teams in the J. League. Not only that, one of the few to have spent every season in the top flight. We can only imagine where the next 20 years and beyond will take us, but you can guarantee one thing - it's not going to be boring! 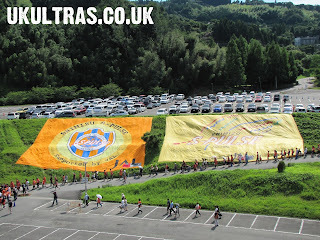 Congratulations to everyone connected with our club, and here's to many, many years as the heart of football in Shizuoka. 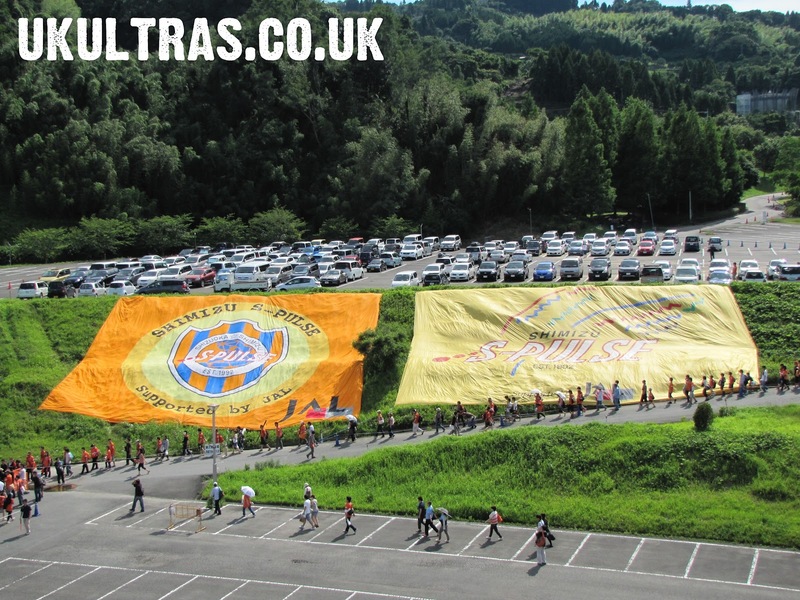 As the best supported and most glamorous club in the prefecture (by a mile on both counts) we're set to sell out this Saturday's 20th anniversary game with Kawasaki Frontale. If you've not got your ticket yet, don't delay! Come and watch us leap back into the league reckoning with all three points, at the same time getting that damn 1000th league goal out the way! Hey, at least nobody got booked. Apologies for the slow update, but who can blame me? 91st minute winner for the opposition. Gutted. I wasn't at Nack5, nor was I watching on the box. I was previously engaged at a friend's birthday bash, so at least was able to immediately start drowning my sorrows when I saw the last gasp winner come through. No win in six, but despite that we're still only 3 points off third, such is the congested nature of this year's table. Next up is our 20th anniversary game. We turn 20 years old on July 4th with Saturday the 7th being our big birthday bash. If we score a goal (a big if? no - we're due an explosion of goals) it'll be our 1000th in the league since 1992. Who'll get it? My money's on Omae Genki. Expect lots of pics and whatnot from our 20th birthday do on Sunday. 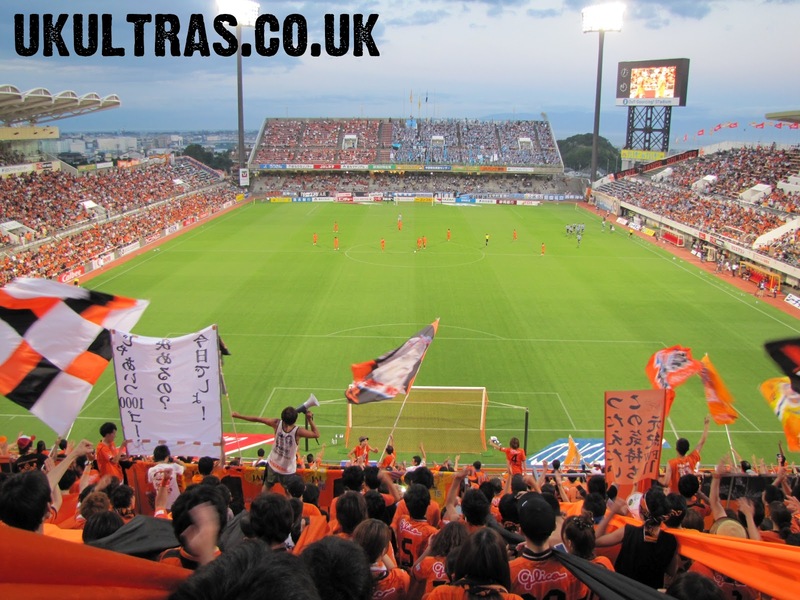 Read all about the Omiya game from the man at the helm, Afshin Ghotbi on his personal website here. Extended highlights. Wish we could find these for every game! First half.